kitchen all within a relaxing tavern-style motif. This already popular Outer Banks Restaurant is located adjacent to the Sea Scape Golf Links. Customers are raving about the new decor and large bar area with 7 big-screens,and extensive local and regional wine and beer selections. Looking for the perfect Outer Banks Wedding Venue? 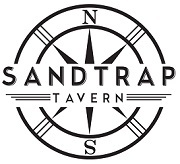 With ocean to fairway views, large tent capabilities, Outer Banks catering for large parties and weddings are a dream at Sandtrap Tavern.